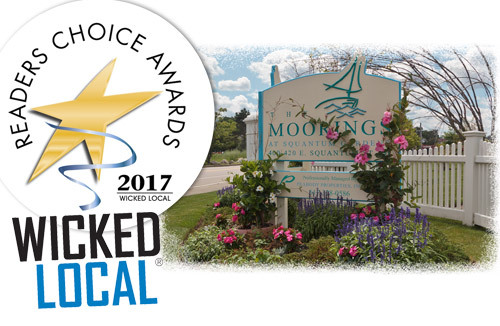 Braintree and Quincy, MA (August 2, 2017) – Peabody Properties is proud to announce that The Moorings at Squantum Gardens (a Peabody Properties community) received an Honorable Mention in the Retirement Living Facility category of the Wicked Local Readers Choice Awards. The year’s edition marks the 22nd anniversary of the Readers Choice Awards, compiled by Wicked Local Media Solutions. For more than 20 years, readers have been voting on their favorite places, services and things to do in and around their communities. 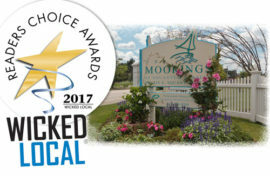 The Moorings at Squantum Gardens, in charming Marina Bay, Quincy, features a picturesque collection of 223 one- and two-bedroom apartment homes with panoramic views of the Boston skyline and Quincy Bay. Designed for residents ages 55 and older, this beautiful community features two four-story buildings with amenities including a vibrant community gathering space, fireplace reading room, manicured grounds, walking paths, and centrally located gazebos. Additionally, the on-site resident service program aids and encourages residents to participate in many programs and activities, as well as provides individual support services.